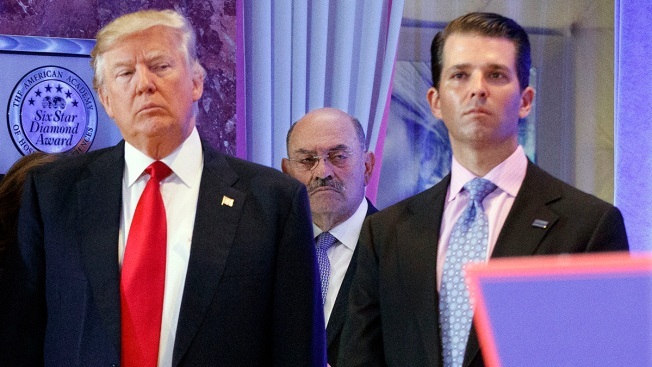 FILE - In this Jan. 11, 2017 file photo, Allen Weisselberg, center, is seen between then-President-elect Donald Trump, left, and Donald Trump Jr., at a news conference in the lobby of Trump Tower in New York. New York state regulators have issued a subpoena to the Trump Organization's insurance company as part of an investigation into the president's family business, NBC News reported. The move by the New York State Department of Financial Services adds to the growing scrutiny facing the Trump Organization. The subpoena was issued to Aon insurance company, according to NBC News' source, in an investigation of the insurance policies and claims tied to Trump's namesake firm. Word of the subpoena, which was first reported by The New York Times, comes as the Trump Organization is already under scrutiny by congressional committees and federal prosecutors.